Christ admonished His followers not to forswear themselves, including warning against swearing by heaven, the earth, or one's own head. The language used is sometimes difficult for a modern reader to understand, but the meaning seems to be to honor one's word without needing to use binding oaths. Recently however I thought of another, perhaps unconventional but possible interpretation of not swearing by one's head. 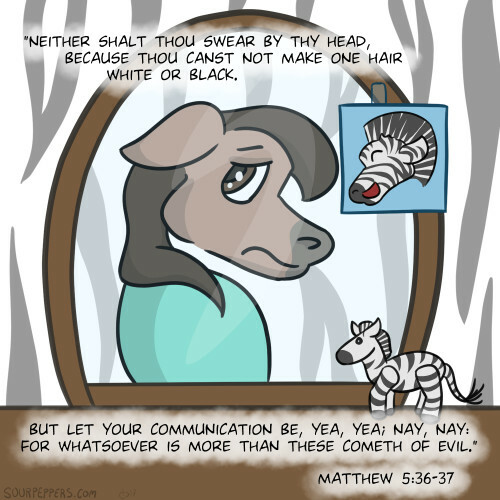 Christ points out that we cannot make one hair white or black, and uses this as a reason to not swear by our heads; it's as if our own inability to keep such an oath is the very reason we shouldn't make it in the first place, which seems to make sense. Perhaps we can take this a bit further and think about the "oaths" or promises we make to ourselves. Given the current time of year, I am of course referring to personal goals, and yes, even New Years Resolutions. The practice of setting New Years Resolutions has come under harsh criticism in recent years, not least of all because of how frequently they are broken mere days after being set. But one common, major problem with resolutions, as well as any personal goal, is our tendency to set goals for things we cannot control. For example, one common goal is to lose a certain amount of weight. However, that's not a good goal because it isn't something we can directly control. What we can control is our behaviors that may lead to weight loss, such as eating healthier and exercising. Goals should be actionable. They should be things we can actually do and directly control. So whether you're setting New Years Resolutions, or smaller personal goals, remember to focus on what you can actually control, not just on the desired outcome. Instead of resolving to lose weight, resolve to exercise more, eat more vegetables and lean protein, and reduce the consumption of unhealthy snacks and sweets. Instead of resolving to overcome an addiction, resolve to have frequent contact with friends and family who support you and avoid (as much as possible) situations that trigger cravings. Instead of resolving to do better at work or school, resolve to set aside time for uninterrupted study and set a daily plan for what needs to be accomplished. Instead of resolving to eliminate debt or save money, resolve to set a budget, spend less on eating out and entertainment, and find ways to reduce costs or earn extra money. Instead of resolving to find a new job, resolve to fill out a certain number of applications each week and spend time learning new skills or developing current ones. Instead of resolving to improve your relationship with someone, resolve to perform specific acts of service for them and avoid doing and saying things that hurt them. Instead of resolving to become closer to God, resolve to sincerely pray to Him daily, study the scriptures, and strive to keep His commandments. Whatever goals you set for yourself, make sure they are actionable and measurable, and hold yourself accountable. If you do these things, you will be more likely to see progress towards the outcomes you desire like the ones listed in bold above. And if you don't see the progress you want, you can know that you made an honest effort, and adjust those efforts to try again.